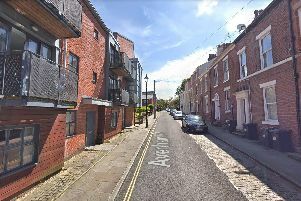 A former rough sleeper has suffered burns to his hands after a fire broke out a flat used for homeless accommodation in Chorley. Two fire engines from Chorley attended the fire at a flat at Cotswold Supported Housing in Cotswold Road, off Pall Mall at 1.51am on Thursday, March 21. Two fire engines from Chorley attended a fire in a flat on Cotswold Road in Chorley on Thursday, March 21 at 1.50am. The fire was out when crews arrived, but firefighters had to use a ventilation unit to clear thick smoke from the flat. The fire service said one casualty suffered smoke inhalation and minor burns. He was taken to hospital for treatment. Cotswold Supported Housing in Chorley provides accommodation for single, non-priority homeless people and homeless families. It is a former sheltered housing block, built in the 1950s and converted into a supported housing scheme for homeless people in the 1990s. It has has 25 beds and is staffed 24 hours a day.